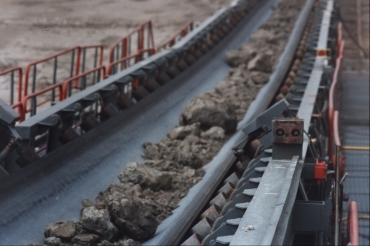 The belts are made of core which consists of mesh made of longitudinal brassed steel cords: longitudinal conditioning longitudinal strength of the belts and lateral conditioning high resistance of these belts to tearing and impacts. Metal mesh is vulcanized in special core rubber and is coated with rubber covers. Rubber-steel core ensures also exceptionally low elongation, high operational lifetime and low failure frequency.